SGS - Super Grand Sport: The quickest of all groups, this class was introduced in 2000 for the fastest mass produced vehicles. Cars competing in this group included the Chevrolet Corvette C5, Chevrolet Corvette Z06, Dodge Viper, Saleen Mustang SR, Porsche 911 Turbo, Porsche 996, etc. GS - Grand Sport: This class included cars such as Pontiac Firebird, BMW M3, Acura NSX, Ford Mustang Cobra R, Porsche 993, etc. ST - Sports Touring: Another new class for the 2000 season was Sports Touring. Popular vehicles found in this group were the BMW Z3 Coupe, Acura Integra Type R, BMW 328, Lexus GS 400, Lexus IS 300, Porsche Boxster, etc. C2K – Compact 2000: It included the Honda Civic Si, Acura Integra GSR, Hyundai Tiburon, Mazda Miata, Mazda Protégé, Mazda 6, etc. Close competitive racing with cars that fans could relate to contributed to the popularity of the series. It also provided an environment for automotive manufacturers to test and showcase their products. 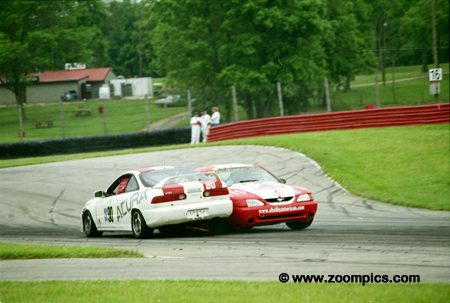 The Mid-Ohio race marked the fifth event of the 2001 Grand-Am Cup season. Sixty-two entries started the three-hour race on the 2.25-mile thirteen-turn road course. 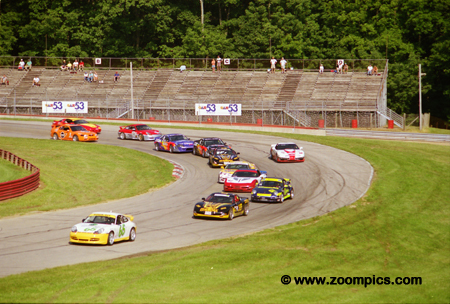 The start of the first lap and the pole winning Speedsource Porsche 911 Supercup leads the field into the 'Esses'. The Phoenix American Motorsports Chevrolet Corvette which started third has already moved to second and will move into the lead. The Corvette maintained the lead until late in the race, when fuel issues dropped the car to third. 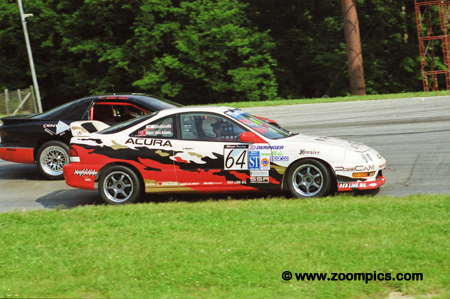 In the closing stages of the race the Grand Sport Ford Mustang Cobra R of Shreiner Racing and the Sports Touring class Spirit of Miami Acura Integra Type R were involved in an incident at the 'Carousel'. One of the front-running C2K entries arrived just in time to become involved in the melee. The No. 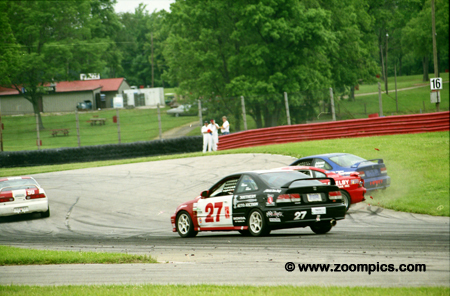 27 Honda of Bob Beede and Frank Del Vecchio slips by as the Honda American Race Team (HART) Honda Civic Si shared by Peter Halsmer and Bryan Johnson makes contact with the Shreiner Mustang. The HART and Shreiner cars were forced to retire. Devon Powell and Doug Goad earned their second straight Grand Am Cup SGS victory and third of the season. 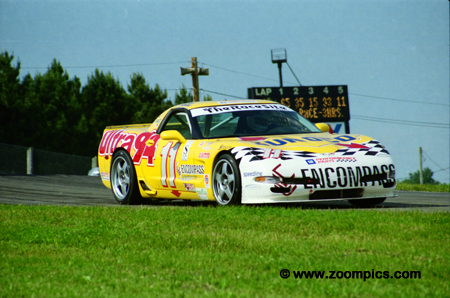 The early part of the race was dominated by one of the Phoenix American Motorsports Corvettes but fuel pick-up problems allowed the Powell Motorsport drivers to take the lead and win. 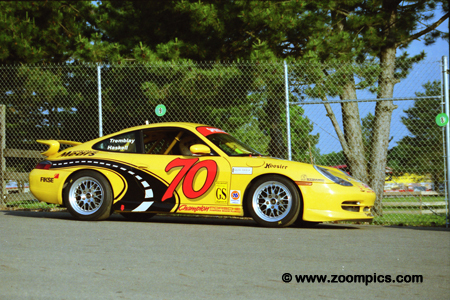 Sylvain Tremblay and David Haskell qualified first the Grand Sport class driving a Speedsource prepared Porsche 911 Super Cup. The pair dominated the race taking the class victory by an incredible one-lap margin. Two Porsches qualified on the front row for the Grand-Am Cup race. 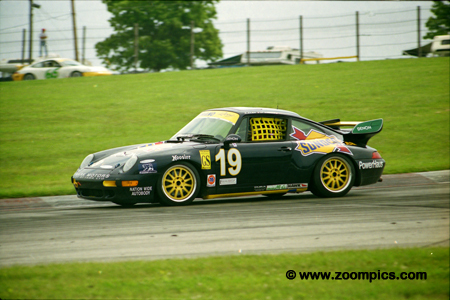 The Speedsource 911 Cup car took the pole and shared the front row with the No. 15 Motorsport Technologies Porsche TT. Dino Steiner and Ian James shared the driving duties in the No. 15 Porsche. They would finish where they started second overall and in SGS. The Planet Earth Motorsports team finished first and third in the C2K category. The No. 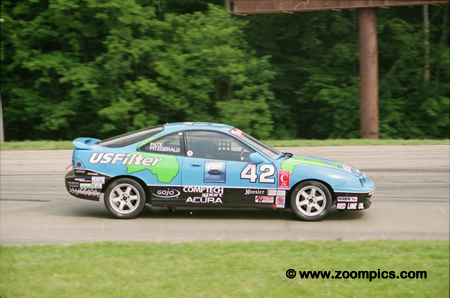 42 class winning Acura Integra GSR was shared by Wayne Nonnamaker, Bill Pate and Mike Fitzgerald. Their second car was driven by Fitzgerald and Will Nonnamaker. 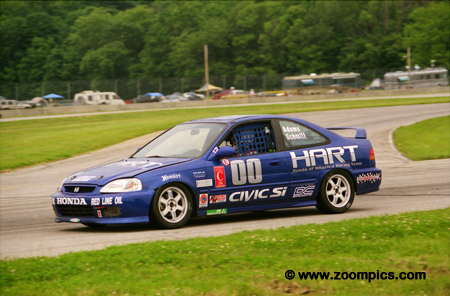 Finishing second in C2K was the HART Honda Civic of Kevin Adams and John Schmitt. The No. 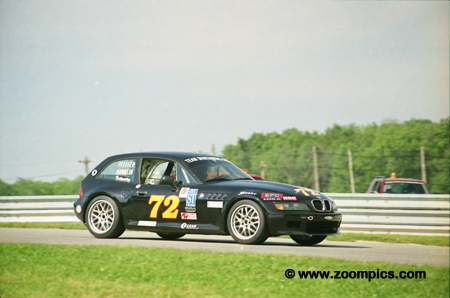 72 BMW Z3 of Team Spartanburg was the fastest qualifier in Sports Touring and captured the class win. The car was driven by Jim Hamblin and Steve Pfeifer. The pair was in a tight battle with one of the Team Lexus IS 300s but gained the upper hand during a pit-stop. The car ran low on fuel late in the race but they were still able to score a victory. Jean-Francois Dumoulin and Robert Julien qualified and finished second in their Grand Sport class Porsche 993. 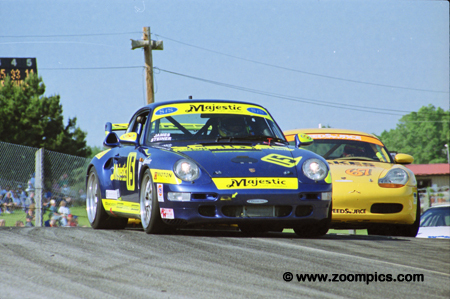 The pair exchanged second place several times throughout the race will the Turbo Performance Center Porsche 993 driven by Michael Levitas and Freddy Baker. Levitas and Baker were later disqualified. The No. 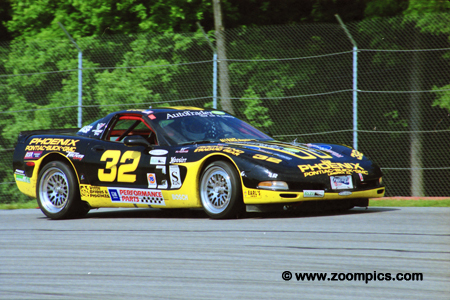 35 Phoenix American Motorsports Chevrolet Corvette was shared by John Heinricy and Jeff Altenburg. Taking advantage of cautions early in the race allowed the team to lead the race and build a thirty-second lead. Unfortunately, late in the race the car slowed when it developed fuel pick-up problems. They finished third despite the efforts of their teammates to block the Powell and Motorsport Technology cars. After the lead HART Honda Civic Si was involved in a late-race incident, it was the job of No. 00 to uphold the team’s honour. John Schmitt and Kevin Adams started the car fifth in C2K – fifty-first overall. Although they finished a lap behind the class winning Planet Earth Motorsports Acura it was good enough for a second in C2K. 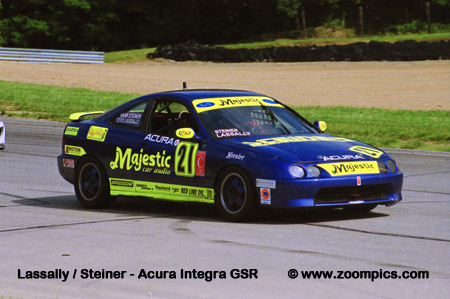 The King Motorsports Acura Integra Type R was shared by Bob Endicott and Mike Van Sicklen. They qualified seventh in class and moved up to finish 3.378-seconds behind the class winning Sports Touring BMW Z3 Coupe of Steve Pfeifer and Jim Hamblin.